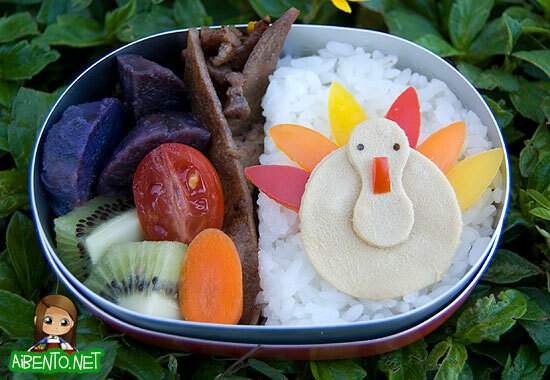 It’s kind of funny that I’m doing Thanksgiving bentos with teriyaki foods, but since I’m not about to roast a turkey just to put some into an authentic turkey bento, the “real” Thanksgiving bentos will have to wait until next week. We’re buying our dinner from the Hawaii Prince this year, something that I admit makes me a little sad because we’ve been buying our dinners for a few years in a row now. Some day I’ll remember everything that my mom told me about how to roast a turkey without asking her again the next year! This lil gal was a lot easier to make than I thought. I used three different cutters and a nori punch. It’s packed in my little metal Totoro tin, which I love for its small size, shape, and rounded top. I hate bento boxes that have a cover that pushes the food inward. They’re terrible for any kind of decoben! The food itself was really easy to put together. The rice went in first, then the meat, which I sliced up with a kitchen shears, then the sweet potato. I needed green but had no veggies, so I cut up a kiwi fruit and then added red with a half tomato and a sliced baby carrot. Here’s a close-up of the turkey. After my little egg substitute rant yesterday, I actually found a good use for it: making usuyaki tamagoUsuyaki tamago means 'thinly cooked egg' in Japanese and is often used for making character bentos!! Egg substitute seems to cook fine if you don’t care about the weird skin-like texture and the real bonus comes from the fact that you don’t have to worry about straining the egg and losing a lot of egg white in the process. I simply poured it out of the carton, added potato starch and soy sauce, and fried it up. I’d added a good amount of soy sauce to this batch, so if you want a dark brown sheet, you’ll still have to go with just the egg yolk. I cut a circle out and then a peanut shape with the pink wheel from this food cutter wheel set. I had wanted to make white cheese eyes to make big eyes, but ran out of time so I just added two little nori eyes. For the feathers, I used one of the flower cutters from this Fondant Cutter Set I got last year from Mr. Pikko. I cut two feathers each from three colors of bell pepper, then used one of the red scraps for the comb. I made a bento for Mr. Pikko too, but didn’t take a photo. Despite my little whine about dinner, I actually can’t wait. I love turkey dinners. The only thing wrong with Thanksgiving in Hawaii is that we tack on one more starch to the pile and usually have to cook rice. So there’s rice and mashed potatoes and corn and stuffing and sweet potatoes and yams. Woohoo, what a low carb NIGHTMARE! Still, oh so good. 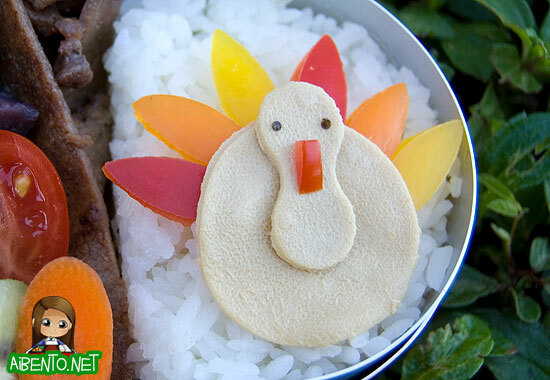 I must admit, I’m all out of Thanksgiving ideas already. LOL! We’ll see what I come up with tomorrow.